Taking in account Split’s age it is expected that the city older than 1700 years will be filled with monuments and interesting sights to visit. Most of the monuments are preserved from the ancient times, are UNESCO protected and internationally acclaimed as some of the most important archaeological findings of their kind. 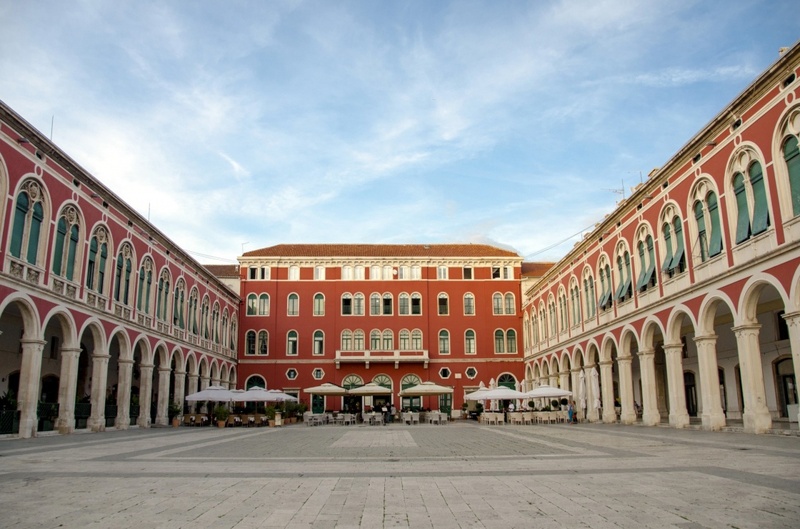 The most popular, the biggest and certainly the most important sight of Split is its origin point; the Diocletian’s Palace itself. Its original structure is mostly preserved, but also significantly changed and in some cases devastated by the various urbanistic interventions and modifications over the course of its long history. The majority of its space is today inhabited with private houses, museums, restaurants, cafe bars and shops. There are four entrances into the Palace: Golden Gate from the north, Silver Gate from the east, Brass Gate from the south and Iron Gate from the west. The gates are connected by the two main streets, Cardo and Decumanus, intersecting at the center of the Palace, the Peristyle. Many cultural events take place at Peristyle today continuing its mystic tradition of the most important place in the palace. Beside Peristyle there is the bell tower with the Cathedral of St. Duje, the city patron. It is watched over by the statue of sphinx, imported from Egypt by Diocletian and preserved until the present day. Across the Cathedral lies the former Jupiter’s Temple, hidden behind a small maze of the narrowest streets in Split and also watched over by another statue of sphinx. South of Peristyle is a beautiful Vestibule, an ancient imperial antechamber. Rectangular from the outside and oval from the inside with the opened ceiling, it is a beautiful and impressive sight. The monumental stairs lead fro Peristyle into the ancient cellars of the Palace. They were used as the foundation of the upper residential area. Today they are re-purposed as the venue for exhibitions, events and souvenir stands. The most popular Split sight outside of the Palace is the Marmont’s Street. Built in the early 19th century, it was the first modern-type street in the city. Today it is definitely the most crowded part of the city center, famous not only for its beauty and charm but also for its historical significance. It hosts one of the oldest city pharmacies, an old cinema and a fish market. The flies don’t disturb the merchandise due to the nearby sulfur springs. The city waterfront, Riva, gained its present form two centuries ago during the French rule. 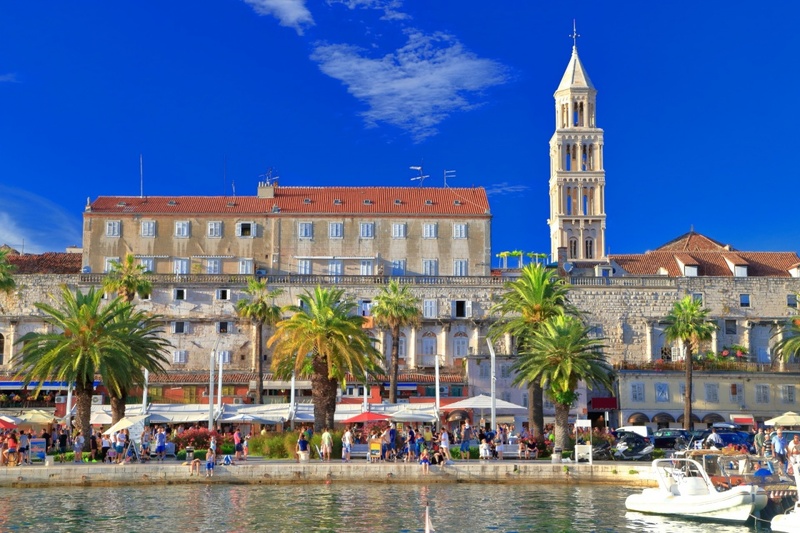 It features the southern walls of the Diocletian’s Palace, the Franciscan Monastery and a Harbor Master’s building. It is an always crowded pedestrian paradise, filled with cafe bars and shops. Riva offers a spectacular view of the city harbor, Marjan and the surrounding islands. Split has numerous romantic squares: the architecturally diverse Pjaca built in the 13th century, with the examples of Romanic and Renaissance buildings; Prokurative, the monumental neo-Renaissance square resembling the style of the Venetian architecture; and Vocni Trg (The Fruit Square), with the octagonal tower from the early renaissance and the baroque Palace Milesi. 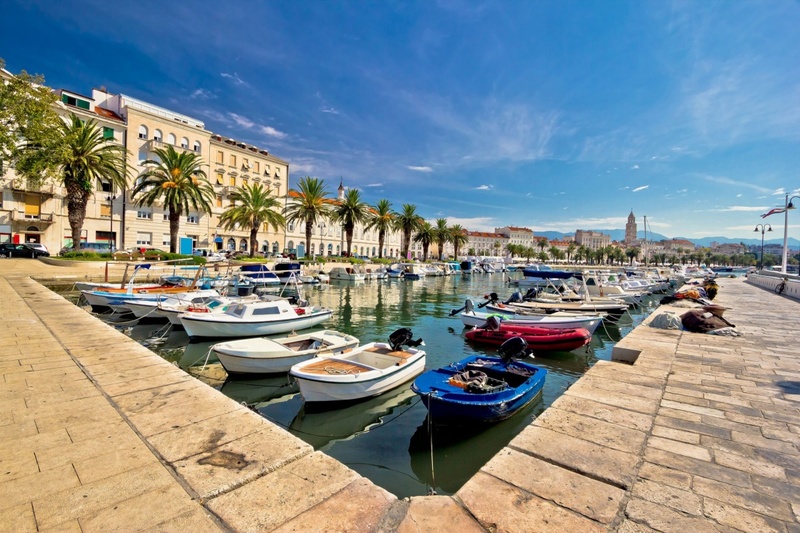 Although Split is a modern coastal city, there are certain parts of the town that still resemble and proudly preserve the romantic atmosphere of a small maritime settlement. You shouldn't miss to take a walk down the narrow, stone covered streets of Veli Varos and Radunica and visit their historically valuable churches. Be sure to take a walk around Marjan, the forested hill overlooking the city. Not only is it popular as a favorite recreation site, but it also hosts several small churches and a modest zoo ideal for children. 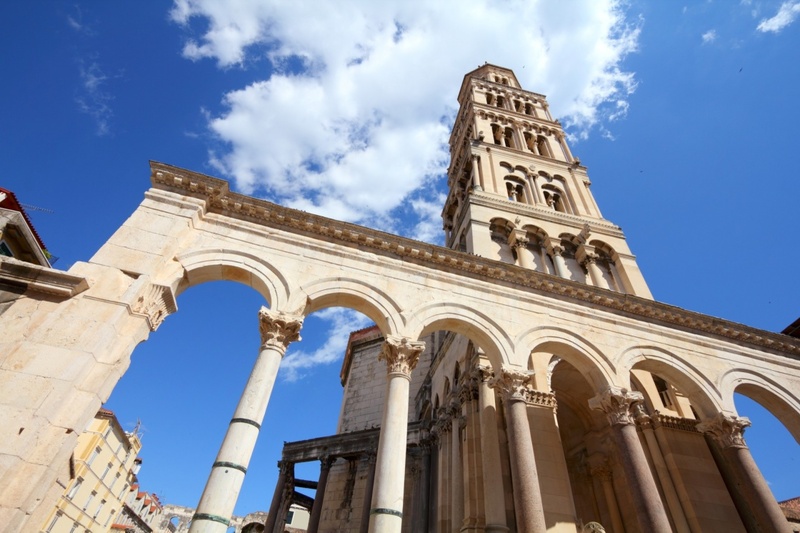 There are almost countless other sights to explore in Split. Almost every street, every building and every stone has its own interesting story to tell. A simple walk through the city center will take you to a private expedition through the turbulent history and help you discover some of the city’s well hidden secrets scrambled across the ancient walls and monuments.